Our last post may have left some wondering a bit about a seeming contradiction between the figures we report in Part 3 and those we report in Part 4. We thought we should clarify things and in the process—we hope—strengthen our growing understanding of the gloomy mood surrounding much of the book publishing industry. 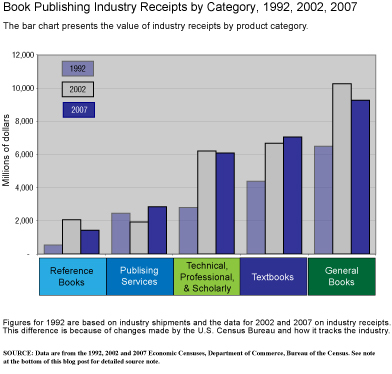 In Part 3 of this little look at book publishing industry statistics we presented a chart that showed nice growth in industry receipts from 1992 to 2007. That growth was across the board, for every product category although some grew more quickly than others. Then we shifted a bit and in Part 4 we talked about receipts declining while the number of new titles soared. Well, the problem has to do with the fact that we were covering different time periods in these two posts. Here’s the original chart as shown in Part 3. And here it is again, with the addition of data for 2002. How different it now looks. While the facts presented for 1992 and 2007 are identical in the two charts, the addition of data for 2002 changes one’s understanding, one’s sense of the period covered. 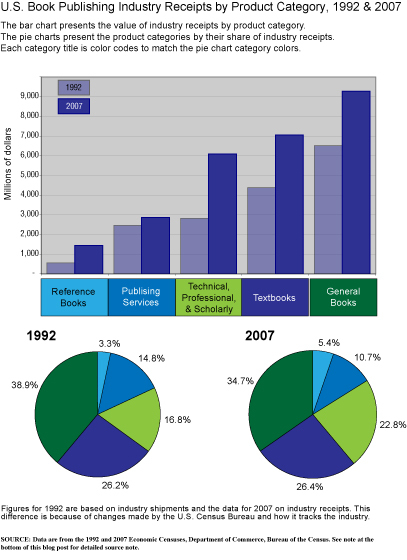 Knowing that industry receipts had actually risen greatly during the decade 1992 to 2002 and then fallen—in the case of reference books and fiction, quite substantially—changes things. Yes, sales receipts are up since 1992 but they were much further up in 2002 and are now trending downward. There is so much we could say here about how statistics are presented and how that presentation can skew things, even when the stats are accurate. The example here is a good one. While it is true that the industry as a whole is seeing increasing revenues over the last two decades, by looking at only two years worth of data one doesn’t see the fluctuations taking place on that trend line, fluctuations that may tell a very interesting story. We’ll get back to the number of titles published annually in our next posts, when we start looking at the book selling industry’s statistics. Data for 1992 come from Manufacturing USA, 5th edition, Gale Research, page 704, and are based on the 1992 Economic Census, Product Share Details. Data for 2007 come from the 2007 Economic Census, available online here. The Economic Census is produced every five years by the U.S. Department of Commerce, Bureau of the Census. While re-reading these stats I was reminded of a thought I had the other day about blogging. This type of “writing” and “reading” are now more popular than reading books, it seems. These two Rs, and even the 3rd one “rithmetic” or numbers, are now also taught in school. Almost every student now is equipped with his/her own laptop (soon perhaps the IPad…). And as literature and some fiction, stunningly beautiful and inspiring writing can be found even in blogs. However, even the most pedestrian or journalistic reporting on blogs will often hold my interest because I cannot find the information in our mainstream media. Our putative Free Press often deliberately spins ignores, or entirely withholds some information, I fear. So – while probably not possible to gather such data, it would be revealing to compare the time spent in writing and reading blogs with time spent reading those published books. Cost may be a factor, too. Yes, that is an interesting point. We seem, as a society to be reading quite a lot, actualy. Just not in the way we used to. And, tracking this is interesting, but difficult.